You can already slice by division. 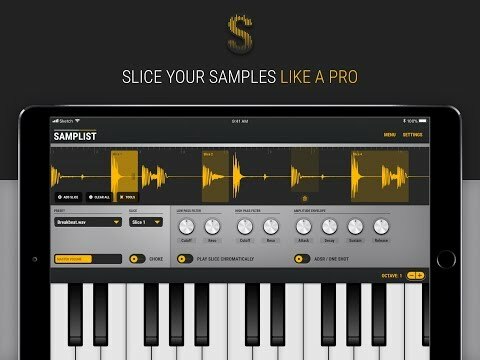 Tools > Split sample. I'll probably rename the option. By grid is not possible atm, since I don't do tempo detection. Cool! Maybe you could let the user input the tempo manually. I'm looking forward to getting this! Yeah, I thought of that. But I don't know yet how to save the info in the wav file itself. Well, assuming you have a fixed bar loop, you can split in regions and you basically have your 4ths, 16ths, etc..
Good point. Trim the loop and then split it. Done! also an idea for future update. sample layering with each layer having its own adar. then you could hit a pad, and have one sample start playing and fade into another sample. After I'll release the Poly mode, I'll focus on sampler bread & butter. Filter ADSR, LFO, reverse & all that. and in a future version I'm planning a sequencer which should be able to play with Link. But I don't promise anything atm because I haven't read the Link documentation yet. @alecsbuga Ok, but please hit the submit button first. Another day, another slew of love and improvements big thanks! Ok so it took me a while but I'm quite happy with what I've got so far. Hopefully I'll push the update tonight to the App Store. Samplist now plays like butter. I bought the app before seeing those videos, and now even more wowed. Congrats on your first iOS music app! Looking forward to seeing where this goes. ...is it “tonight” yet where you are from?? I'm done with the keyboard. I've disabled the pitch shifter for now because it's too intensive on the CPU and it has lag so it's useless. I've added a bonus feature which I'm not talking about. I'll let it be a surprise. I need to brush up the design of the bonus feature when I get home and submit it. Samplist 1.2.7 is waiting for review. Wow. It's been a hectic week guys. I really appreciate your feedback. And although I haven't replied to everyone, I read all of it and took notice of your ideas. Once again thank you for your support and understanding, and please please please I would really appreciate it if you can give a rating / review on the App Store. It really helps a lot small indie developers. That being said, I'll leave you to a preview of the new Samplist. Nice little teaser for the uninitiated there...come a long way in a week Just think where we'll all be by the Summer! Just think where we'll all be by the Summer! is samplist coming to iphone ? It won't be difficult to design a separate UI, but at the moment I'm working on stabilizing what Samplist is and what it does. If you like it, leave a review! In US AppStore, there were six reviews. My 5 star review bumped it up to a solid 4 star app. The two 1 star reviews were left by people who couldn’t figure out Audiobus/ IAA. that is ruining the average. To their credit, it is not clear in the App Store description that this sampler app does not sample... by that I mean there is no way to directly record a sample into it, not by mic and not by AB or IAA. I know this feature is coming, because I’ve read thru 9 pages of this thread on this forum. And I know how to manage file importing in the meantime. The average AppStore visitor might not know all this, which is I think the reason for the 1 star reviews. Well there was just this 1 guy. The other were well deserved. The app crashed like hell on iOS 10. But yeah, some honest reviews would be great! I've updated the description also because now IT IS RECORDING That was the bonus feature. I couldn't write the description like this: "This app doesn't sample" ) It was like shooting my leg.